DNA Matching Now Out of Beta! In September we released DNA Matching in Beta mode. We are happy to announce that it is now out of Beta. As a reminder, MyHeritage allows people who have tested their DNA on other services to upload the DNA data to MyHeritage for free, and receive free DNA Matches. DNA Matches have a vast potential for finding and connecting with previously unknown relatives, by locating people who share the same DNA segments with you, inherited from a common ancestor. The more DNA is shared, the closer the connection. Doing this on MyHeritage is beneficial because MyHeritage has implemented cross-vendor matching; for example people tested on 23andMe can receive matches with people tested on AncestryDNA, something not possible on either one of these services. DNA data from FamilyTreeDNA can be uploaded for matching too. MyHeritage supports the latest DNA chip versions used by all these vendors and in most DNA Matches you can view the family trees of those users and gain additional insights about your potential connection, which is often not possible in other services not having as many family trees as MyHeritage. MyHeritage’s huge international user base provides opportunities to match a broad base of users, and there have already been success stories with DNA among MyHeritage users that show how great the potential is for more and more families to be reunited thanks to this technology. DNA Matching in Beta mode was a good start, but it wasn’t perfect. There were many false positives in our Beta release and the initial accuracy was not on a level that we were satisfied with. We also received feedback from the community about missing features and functionality. Following the initial release, we have been working around the clock to improve DNA Matching, optimize the accuracy of the matching algorithms, reduce false positives and add features that will help users get the most out of their matches. As the DNA Matching leaves Beta mode now, all matches have been re-calculated. What this means is that previous matches that are now considered as false positives have been removed, and matches that have had a change in their parameters or predicted relationships are denoted as updated. Matches were not removed if a communication took place between the users on both sides of the match, but the display now shows their information more accurately. Additionally we’ve increased the speed for processing matches. The first processing round took us nearly 3 months as we built the infrastructure. Then it was increased to around two weeks. We are currently calculating matches every week and the process will become daily as of next week, and possibly close to real-time in the future. Searching the DNA matches by person’s name or country is a new feature we’ve added in response to user requests. Thanks @MyHeritage for adding a feature to search my #DNA matches by country or name. It made it so easy to find who I needed today. We’ve also added pagination so you can now click through pages of matches instead of an endless scroll. We are about to release the option to add notes to your matches, requested by the community, and the display of ancestral surnames for each DNA Match, highlighting the surnames that you and the match have in common in your family trees. Our work on DNA Matching is far from done. The accuracy can be improved further. We will continue to enhance and fine-tune it regularly. We are working to implement a very exciting feature roadmap, and you can look forward to improvements every week. 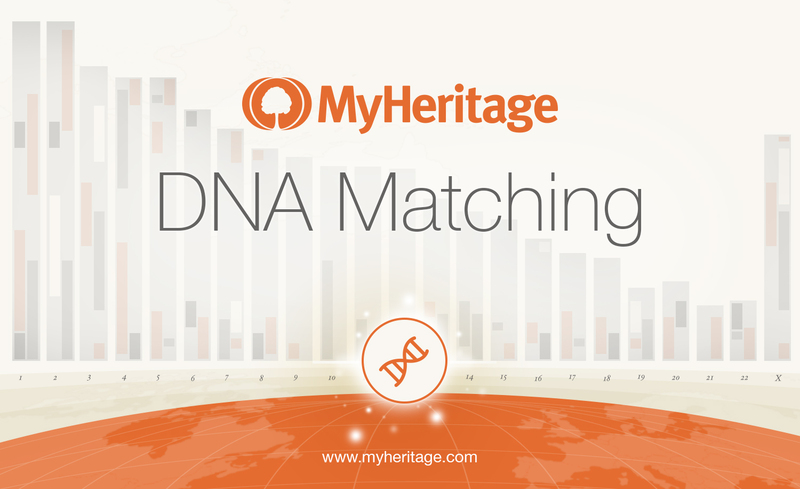 DNA Matching on MyHeritage will keep getting better and better every week, and more matches will be found as more people upload their DNA data every day. We hope that you enjoy using DNA Matching and will look forward to continue to receive your feedback, which is very useful for us as we improve the product. Stay tuned to our blog for more exciting announcements in the near future! I have found a DNA cousin in Canada through DNA matching at MyHeritage. We share Bosman ancestors and are now connected in my tree. I had 800 DNA cousins and some where false. However, now I only have 6 DNA cousins, just like my mother and son. My wife and father also tested. I hope the next weeks it will improve. I use the Gedmatch tool a lot, since I can set DNA relationship to lower levels, which can be helpful to find region-binding ( or sometimes very distant DNA cousins. This made it possible to connect 6 DNA cousins with each other through one tree, connecting them in the year 1200! I hope Y DNA testing one gets cheaper, so I can test it also. Also I hope my wife MtDNA test will someday be usefull, since there is hardly any program that compares MtDNA. I am confused. Via My Heritage, I was tested by 23andMe. Is, or is not, my DNA data available on MyHeritage as a result? Or do I have to do something more? If you’ve already tested through another service, you can upload your test results for free to your MyHeritage family site and benefit from DNA matching.